Big Data Week is the leading global platform of interconnected community events focusing on the social, political, technological impacts of data. It brings together a global community of data scientists, data technologies, data visualisers and data businesses spanning six major commercial, financial, social and technological sectors. The festival connects a number of global cities through locally hosted meetups, events, networking functions, data visualisation demos, debates, discussion and hackathons. Events are designed to provide a platform to educate, inform and inspire – organised by people who are passionate and knowledgeable about data. The London highlight event for Big Data Week is the “Big Data in Use” Conference that will take place October 27th. 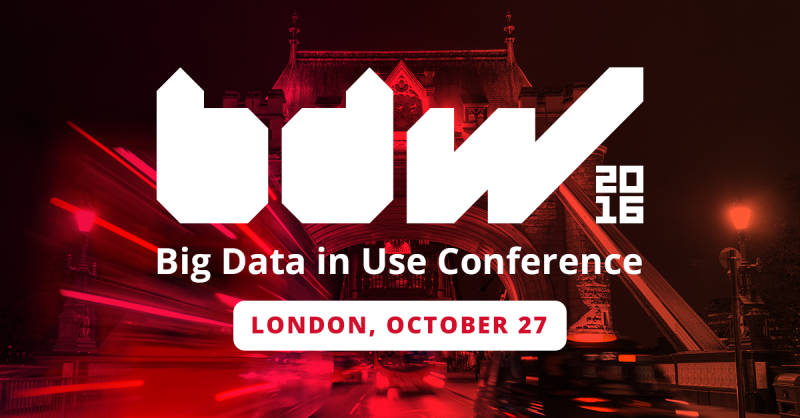 Data experts from several data-driven companies, such as Google, Facebook, TripAdvisor, Shazam, skyscanner, TfL, and NHS are going to speak at Big Data Week, showcasing innovative ideas and best practices that you can implement straight away.